One of the most notorious posts EGG ever wrote. DUNGEONS & DRAGONS® pioneered role playing in the gaming hobby. It brought fantasy before hobbyists, and it set before them a game-form most had never heard of. Perhaps 150,000 persons now play D&D®, but it was by no means an instant success. 1,000 boxed sets, hand assembled and labled, took eleven months to sell, another 1,000 of the same took only five or six months to sell (and Tactical Studies Rules was thrilled). Finally a third printing of 2,000 sold in five months. So from January, 1974, to December, 1975, only 4,000 sets of the original version of the game were in circulation. (Of course, I have no way of knowing how many pirated copies of D&D were in existence, but some estimates place the figure at about 20% of the total sales, some as high as 50%. In any case 5,000 or 6,000 sets was certainly nothing to set the gaming world on fire, or was it?) Today the “Basic Set” sells 4,000 copies per month, and the sales graph is upwards. A month has not gone by in the last two years when I haven’t been interviewed by one or more newspaper writers or independent journalists who want to know all about D&D. I have likewise been interviewed by radio and TV news media, generally for the same reason. At the risk of claiming too much for the game, I have lately taken to likening the whole to Aristotle’s POETICS, carrying the analogy to even more ridiculous heights by stating that each Dungeon Master uses the rules to become a playwrite (hopefully of Shakespearean stature), scripting only plot outlines however, and the players become the Thespians. Before incredulity slackens so as to allow the interviewer to become hostile, I hasten to add that the analogy applies only to the basic parts of the whole pastime, not to the actual merits of D&D, its DMs, or players. If you consider the game, the analogy is actually quite apt. DUNGEONS & DRAGONS is like none other in that it requires the game master to create part or all of a fantasy world. Players must then become personae in this place and interact with the other populace. This is, of course a tall order for all concerned — rules, DM, and players alike. Relating a basic adventure, an episodic game session in the campaign, to a trip in an underground labyrinth does help the uninitiated to understand the simplest D&D fundamentals — discover an unknown area, move around in it by means of descriptive narration from the Dungeon Master, overcome whatever obstacles are there (traps, problems, monsters), and return with whatever has been gained during the course of the whole. The DM takes the part of everything in this fantasy world which is not operated by a player. While this should not mean it is then a game of DM versus the players, it does mean that DUNGEONS & DRAGONS is a co-operative game where players must interact successfully amongst themselves first, and non-hostile portions of the campaign milieu thereafter, in order to be successful. The Dungeon Master is incidentally against the players when he or she is operating that part of the “world” which is hostile, or potentially so, but in general the referee must be disinterested. At about this point I am always asked: “Well, then, how do you win? who wins? !” The answer is, EVERYBODY — providing that the game is well run. The DM gets the satisfaction of testing his abilities against those of the players, the fun of taking the non-player parts, and the accolades of participants when a particularly well-done adventure or series has been completed. Players enjoy the challenges of each situation and have the prospect of continuing adventures and puzzles to confront them, each with his or her game persona. Thus all taking part in the campaign get something besides a momentary diversion. Winning no more applies to D&D than it does to real life. The successful DMs and players gain renown via their campaigns or their superior characters. To enthusiasts of the game it is far more satisfying than triumphing in a single game or whole series of games. Simply stated, D&D is a multi-player game of fantasy role playing, where the rules give systems of resolution for common game occurrences, lists and explanations of things which are not actual (monsters, spells, magic items, etc. ), systems for interaction, and suggestions as to how to put this into the campaign, i.e. create the milieu. Once begun, the campaign continues until the DM and/or all of the players decide it should end. As with any exercise in fantasy it requires suspension of disbelief. Those who find the game interesting will soon enough thereafter create their own sort of involvement and belief. But why is such a game (and similar fantasy role playing games, for that matter) so popular? What is its appeal!? Our modern world has few, if any, frontiers. We can no longer escape to the frontier of the West, explore Darkest Africa, sail to the South Seas. Even Alaska and the Amazon Jungles will soon be lost as wild frontier areas. Furthermore, adventures are not generally possible anymore. The frontiers are receding into memories, modern communications make all of the world available to casual travellers, and the most backward places are becoming more and more civilized. Certainly it is still possible to go scuba diving, mountain climbing, auto racing, sky diving, and so on. These are expensive and risky for no real purpose in most cases. One can also have adventures as a criminal, or possibly as an agent of the government (if one is sufficiently qualified), but the former is distasteful to say the least, and the latter is most unlikely. Americans, with more leisure today than ever, crave entertainment. Some desire adventure and excitement. Obviously, various entertainment media are doing big business — TV, motion pictures, spectator sports, recreational vehicles, sporting goods, book publishers, and game manufacturers are all growing. “Escape fiction” sells better today than ever, and witness the success of the recent science fiction and fantasy films. Looking towards space and the future for new frontiers and adventure is logical. The universe has fascinated mankind since recorded history, and today it seems quite probable that within a few decades numbers of us will live off of the earth, and in a century or so we will travel to the stars. Perhaps there will be frontiers and adventure enough then for all who care to test their mettle. But it is no less surprising for us to look into the realms of fantasy for imagined adventure. Most literate people grow up on a diet of fairy tales, Walt Disney, and comic book superheroes. We somehow relate to stories of young princes going out into the world to seek their fortune, of knights rescuing maidens in distress and slaying dragons, of dealings with wicked magicians and evil witches. The myth of all peoples contain great stocks of such fantasy lore. If nothing else, the desire to believe in such seems to be innate in humanity. Whether or not there are parallel worlds or places where fantastic creatures actually live and magic works is not germane, for most of us are familiar with the concepts as if they were actual, and we have a desire to become involved, if only vicariously, amongst such heroic epics of magic and monsters. 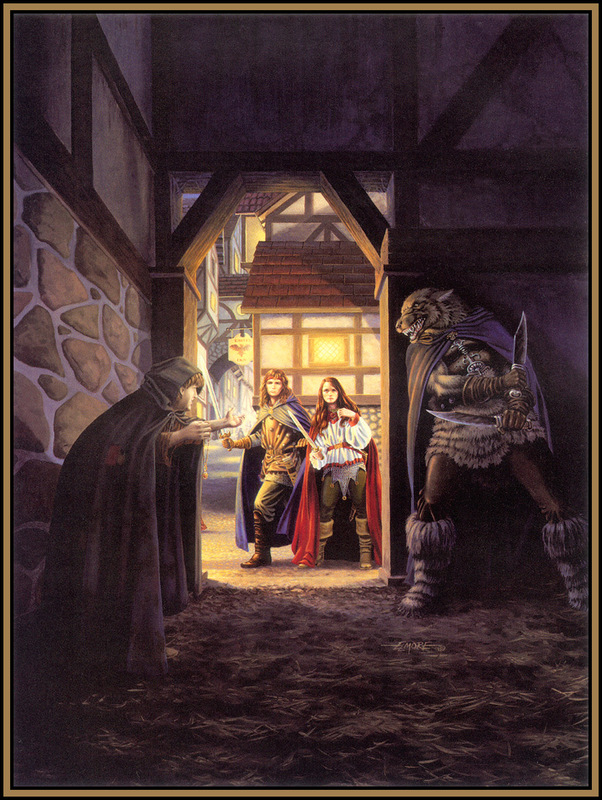 It is therefore scarcely surprising that a game which directly involves participants in a make-believe world of just such nature should prove popular; and had I reasoned out the enthusiasm it roused amongst the first few who played it, it would have been evident that D&D was destined to become a very popular game indeed. (Naturally, hindsight is usually a 20/20 proposition, and the fact is I wrote the game for a small audience of devoted miniatures players . . . ) If millions take to the fantasy world of J.R.R. Tolkien, and nearly as many follow the heroic feats of Conan, the market potential of a game system which provides participants with a pastime which creates play resembling these adventuresome worlds and their inhabitants is bounded only by its accessibility. Access has two prominent aspects; availability is the first; that is, are potential players informed of the fact that the game exists, and are they able to physically obtain it; and difficulty is the second, for if once obtained the game is so abstruse as to be able to be played only by persons with intelligence far above the norm, or if the game demands a volume of preliminary work which is prohibitive for the normal individual, this will be recognized and the offering shunned even if it is available. D&D failed on both counts, and still its following grew. Today we are putting D&D onto the track where it is envisioned it will have both maximum availability and minimum difficulty. This is best illustrated in the “Basic Set.” Well over two years ago we recognized that there was a need for an introductory form of the game. In 1977 the colorfully boxed “Basic Set” was published. It contained simplified, more clearly written rules, dungeon geomorphs, selections of monsters and treasures to place in these dungeons, and a set of polyhedra dice — in short all that a group of beginning players need to start play with relative ease. 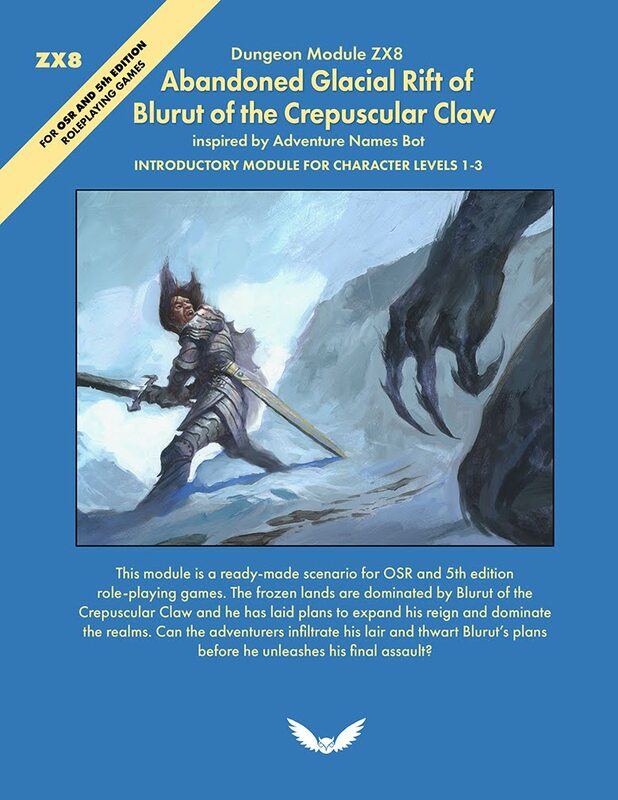 Later editions have cleaned up most of the flaws in the first, and the newest will do away with the geomorphs and list of monsters and treasures in favor of a complete basic module, so that difficulty will be reduced even further. This should broaden the game’s appeal to a base in the millions, and then the major factor becomes availability. Popular demand always increases availability, and D&D has been blessed by its enthusiasts most generously in this regard. Coupled with the work being done by TSR to publicize and promote the game, the availability factor will also be maximized over the next few years. Finally, to maintain interest, a series of new and interesting modular dungeon and outdoor scenarios, as well as more playing aids, will be made available periodically. The number of D&D players should certainly continue to mushroom for several years. Fanatical game hobbyists often express the opinion that DUNGEONS & DRAGONS will continue as an ever-expanding, always improving game system. TSR and I see it a bit differently. Currently D&D is moving in two directions. There is the “Original” game system and the new ADVANCED D&D® system. New participants can move from the “Basic Set” into either form without undue difficulty — especially as playing aid offerings become more numerous, and that is in process now. Americans have somehow come to equate change with improvement. 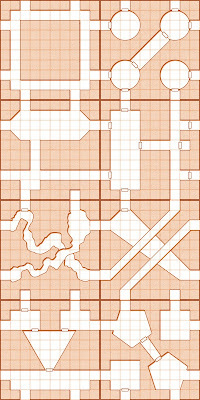 Somehow the school of continuing evolution has conceived that D&D can go on in a state of flux, each new version “new and improved!” From a standpoint of sales, I beam broadly at the very thought of an unending string of new, improved, super, energized, versions of D&D being hyped to the loyal followers of the gaming hobby in general and role playing fantasy games in particular. As a game designer I do not agree, particularly as a gamer who began with chess. The original could benefit from a careful reorganization and expansion to clarify things, and this might be done at some future time. As all of the ADVANCED D&D system is not written yet, it is a bit early for prognostication, but I envision only minor expansions and some rules amending on a gradual, edition to edition, basis. When you have a fine product, it is time to let well enough alone. I do not believe that hobbyists and casual players should be continually barraged with new rules, new systems, and new drains on their purses. Certainly there will be changes, for the game is not perfect; but I do not believe the game is so imperfect as to require constant improvement. Does this mean that D&D will be at a dead end when the last of AD&D® is published? Hardly! Modules and similar material will continue to be released so as to make the DM’s task easier and his or her campaign better. Quite frankly, the appeal of D&D rests principally upon the broad shoulders of the hard-working Dungeon Masters. The rules never need improvement if the DM is doing a proper job, but of course he or she can do so only if the rules are sufficient to allow this. With refined rules and modular additions, all aspects of a long lived and exciting campaign will unquestionably be there for the DM to employ. Will D&D dead end when its novelty dies? That is impossible to answer. It is my personal opinion that the game form is a classic which is of the same stamp as chess and MONOPOLY® ; time will be the judge. No doubt that there is a limit to the appeal of the game in any of its current forms. If tens of millions play a relatively simple, social sort of a game such as MONOPOLY, it is a sure thing that a far more difficult game such as D&D will have a much more limited audience. As the game cannot be simplified beyond a certain point, we look to another means of popularizing it. DUNGEONS & DRAGONS can be played on a computer. Computers are most certainly a big aspect of the near future, particularly the home computer. Non-programmable computer games are already making big inroads into the toy and hobby market. They will grow still more, and soon programmable games will join this trend. D&D program cassettes plugged into a home computer would obviate the need for a DM or other players. Thus the labor of setting up a campaign or the necessity of having a fairly large group to play in it would be removed. The graphic display would be exciting, and the computer would slave away doing all of the record work and mechanics necessary to the game, giving nearly instantaneous results to the player or players. Computerization of D&D has many other benefits also, and such games would not destroy the human-run campaign but supplement game participation. This is the direction we hope to make available to D&D. Let’s see if my foresight is as keen as my hindsight. All that being so, what is the purpose of this column, the reader may justifiably inquire? Well, as I make no claim to perfection, no such claim can be made for ADVANCED D&D or D&D for that matter. This column will cover controversial rules or systems, problem and so-called problem areas of D&D/AD&D, and consider new material as well. If the games are not to be continually changing and “evolving,” neither is it envisioned that they have reached such a state of perfection so as to become immutable. What appears herein is discussion which will sometimes lead to alteration, amendment, or expansion of one or the other system. Initially, what you read here will be direct from me, but all DMs — and players also — are invited to submit article material of high calibre. A glance at the introductory sections of all of the works comprising the D&D/AD&D systems will show that many individuals contributed to the designs. The list in the forthcoming DUNGEON MASTERS GUIDE is longer still. All of these individuals, and the audience at large, are cordially invited to submit their thoughts and opinions on pertinent matters. If I am not to be “the great god gygax,” a claim I have never made nor supported, there must be input which presents argumentation and systems which are meaningful alternatives to replace or augment existing rules and systems. This is not to say that anyone’s favorite variant, even if well designed, is likely to become D&D/AD&D, but at worst reasons for why it is unacceptable will be given, and the possible results could be a major change in the game. So here is your forum. Let us hope it becomes a useful and meaningful exchange! This has nothing to do with the WotRP project I am working on with Al of www.Beyondtheblackgate.blogspot.com I found this interesting article after reading through some old The Dragon magazines, and thought it was a great and relevant description of John Carter. I particularly like that he has a permanent Tower of Iron Will. Nice touch! John Carter was originally an average earthman, but has become a sort of immortal, archetypal warrior; he can recall no childhood, just an endless series of wars and martial endeavors. He always seems to be physically about the age of 30. After serving on the Confederate side of the American Civil War, he went west as a prospector. Trapped in a cave by Indians and mortally wounded, Carter, on the verge of death, somehow psychically transported himself to Mars (or Barsoom, as it is known to its inhabitants). 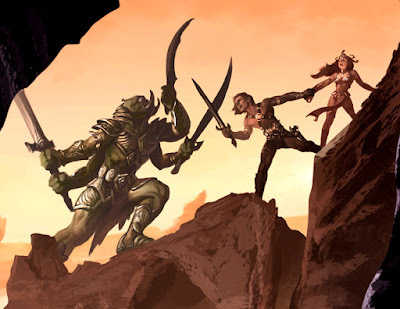 Mars’ gravity is only one-fourth that of Earth, so Carter instantly became the strongest humanoid on Barsoom, with a relative D&D strength of 20 (for game purposes, always treat John Carter as if he were on Barsoom, as this is his heroic environment in the novels). Carter freed Dejah Thoris, Princess of Helium, from the Green Men of Barsoom, eventually married her and became Warlord of Helium (and a good deal of the rest of the planet). Carter’s Mars is a world of paradoxes. Barsoom is a dry, dying planet, studded with abandoned cities and ancient races, falling gradually into barbarism. There is a universal code of honor for hand-to-hand fighting, which states that if one man draws a certain weapon for a duel, his opponent will counter with the same or a lesser weapon. Barsoomian fighters (including John Carter) are usually armed with a dagger (1-4 damage +10), short sword (1-6 damage +10), and long sword (1-8 damage +10). In addition, they carry a pistol, but this is rarely used save by cowards or in wars. Carter abides by the code of honor, and will respond with the same type of weapon he is attacked with (regardless of the number of opponents), unless he is attacked magically (which he may interpret as some sort of psychic attack). Then there is a 50% chance each attack that he will feel justified in using his pistol against the magic-user. This pistol contains five rounds, each doing 1-10 damage if they hit. All five rounds may be fired in one melee round. John Carter is about six feet tall with short black hair and gray eyes. Like all Barsoomians, he wears no armor; only a leather harness for carrying his weapons. His great strength enables him to move in giant leaps. He can jump up to 20 feet high, and leap right over the heads of his opponents. He will generally try to help anyone he thinks is in trouble, but if he is doublecrossed or finds out he has been deceived, he may go into a fighting rage, attacking everyone he can reach until all the miscreants have been punished. Honor in battle is exceedingly important to him. John Carter has long fought the Guild of Assassins on Barsoom, considering them honorless fighters. If he recognizes that a party member is an assassin, he will disarm him and force him to leave the party (for the party’s own good). He will give the assassin his own dagger so he has a fighting chance of reaching safety. Psionically, Carter has a permanent Tower of Iron Will; no one has ever broken it. Over the years he has honed his ability to teleport between worlds, and he is likely to show up anytime, looking for adventure. Dave Trampier is my favorite old school artist. 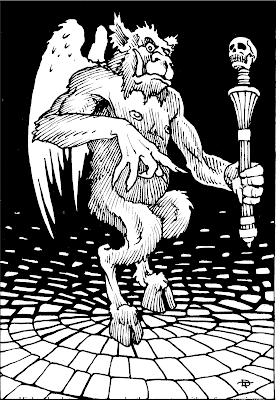 This is an illustration of Orcus from an old The Dragon magazine. 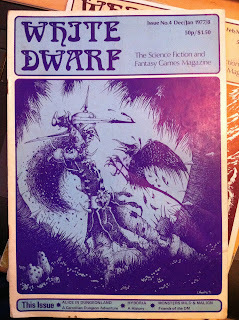 Early White Dwarf is vintage old school. There was no Games Workshop products in my area growing up, and nobody I know of even heard of White Dwarf. It wasn't until I was an adult in the US Army stationed in Ft. Collins Colorado that I was exposed to White Dwarf and the Warhammer universe. Later White Dwarf magazines became a house organ to Games Workshop and pretty much exclusively promoted only their products, so I didn't really get into it. However, my interest in 1970's DnD has compelled me to dig up early White Dwarf magazines. And they are incredibly satisfying. Scratching an itch for old school that only pre #30's Dragon and Dungeoneer magazines scratch. White Dwarf #4 closely resembles early Dragon and Dungeoneer magazines. In fact reading this issue one wonders what DnD would have been like with different creators behind it. 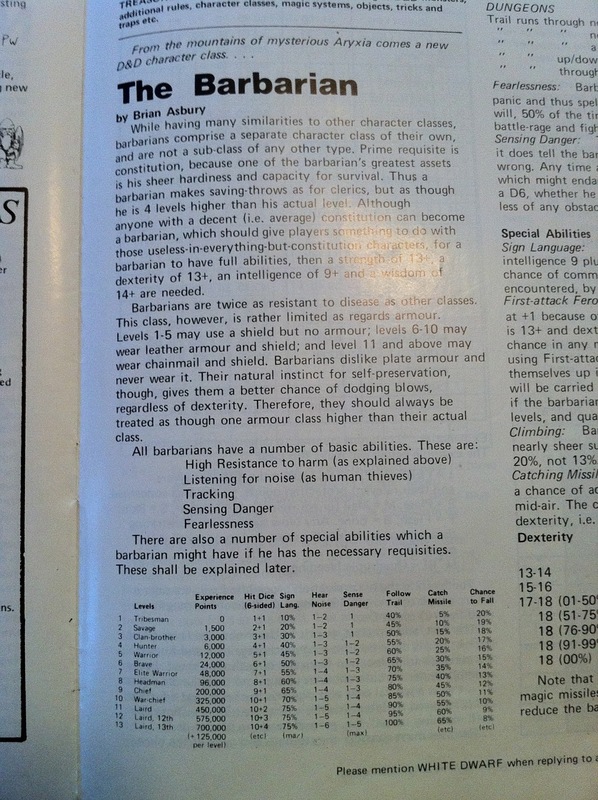 There is a great article on a Barbarian class (which TSR would not publish a version of until July 1982 in Dragon #63). It is fun to see the differences and similarities. Both have tracking skill, but that is about where the similarities end. The White Dwarf Barbarian strikes me as being much truer to the spirit of the original edition. 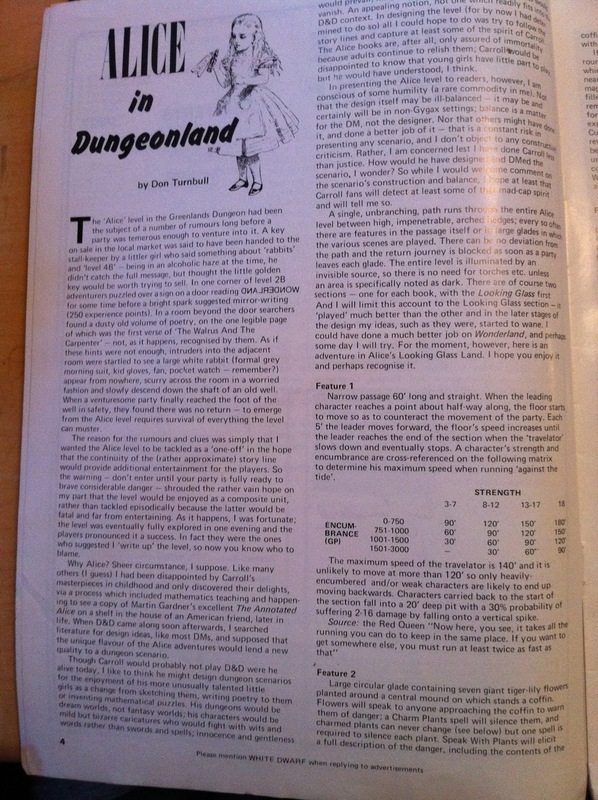 Other articles that predate later TSR offerings include Alice in Dungeon Land (astute readers will recall Gygax's great Dungeonland module), and an article on competitive DnD which was a little hard for me to decipher since it is the 4th in a series of articles which I don't have. 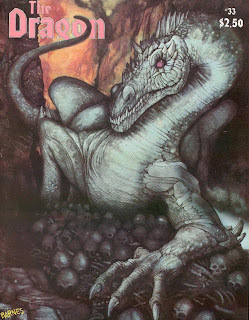 All in all early White Dwarfs are a great read for anyone interested in the formative years of DnD (and the hobby in general), but they are much harder to come by than Dragon is. I would very much enjoy a compilation of White Dwarfs like the Dragon Magazine CD archive. When does Original Edition end and 1st Edition Begin? For a personal project I have been reading the issues of Dragon magazine around the time of the release of the 1st edition books to try to ascertain when exactly the transition from the original LBB's to 1st edition really began. The Monster Manual was first released in 1977, but the Monster Manual could largely be used with the original edition. 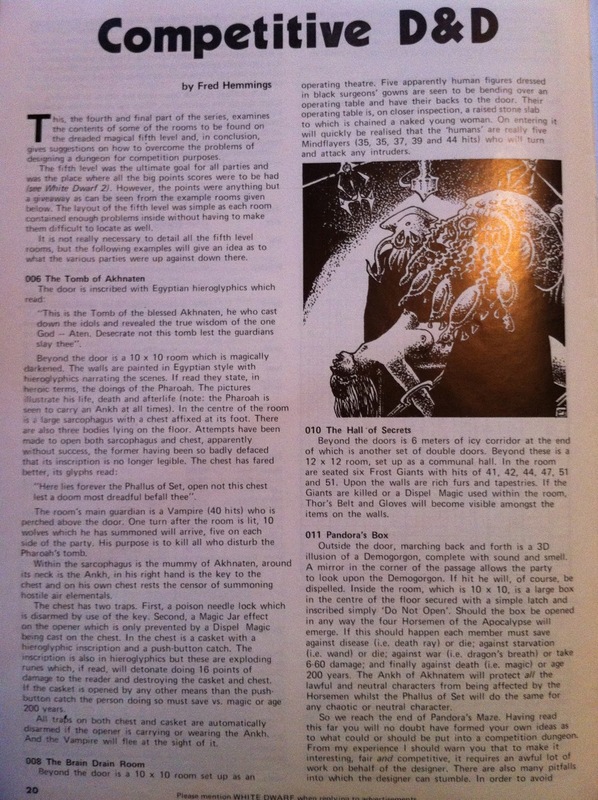 Dragon Magazine 12, released in February of 1978 mentions the Monster Manual briefly, with the header "Advanced D&D Monster Manual" and a 4 paragraph article that says little more than how great the production values are. 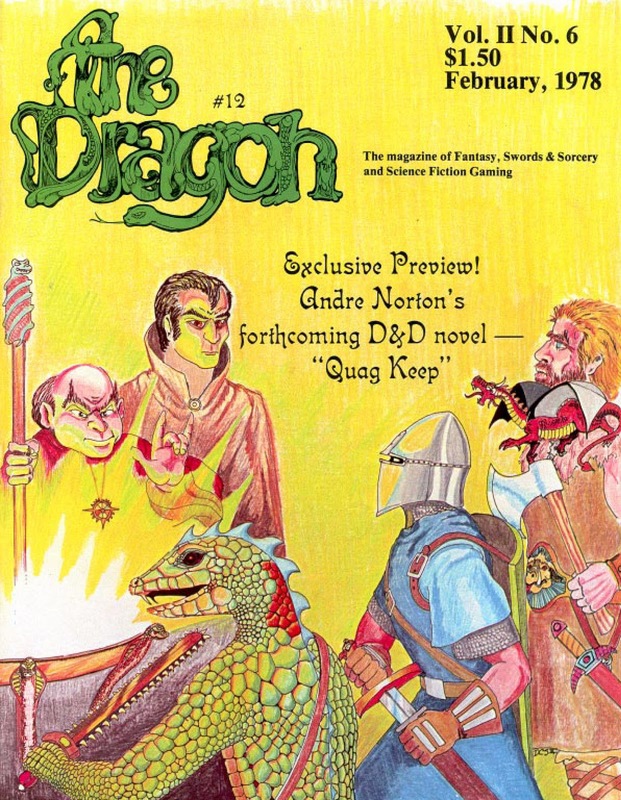 The articles in that issue, and subsequent issues continue to support the original D&D. Even the articles are still for original edition. For example the Witch article in The Dragon 20 could be played with nothing more than the LBB's. Not until The Dragon #22 do we finally get the memo. AD&D is the future, original edition was the past. Sure enough the next issue features an article "Random generation of creatures from the lower planes" which is clearly designed for 1st edition. Still, original edition didn't go down so easily. Articles continued predominately to support the original, while 1st edition articles were few and far between for several issues. The Dragon 28 features an interview with Gary Gygax about the publication of the Dungeon Master's Guide. Then the very next article is "A short course in D&D" an article about D&D, not AD&D. Though it mentions the Player's Handbook (and the Holmes Basic I assume) in a way that sounds like it is merely an extension of, not a replacement, of the original D&D. Though I must say the next issue #29 is really beginning to feel "1st edition", but in a way original edition players wouldn't feel alienated (in fact, I doubt there was any divide yet). The Dragon #30, October 1979, is the first to mention the infamous disappearance of James Egbert. TSR couldn't buy publicity this good. They went from an obscure popular game amongst the niche wargaming crowd to a worldwide phenomenon in a short time. 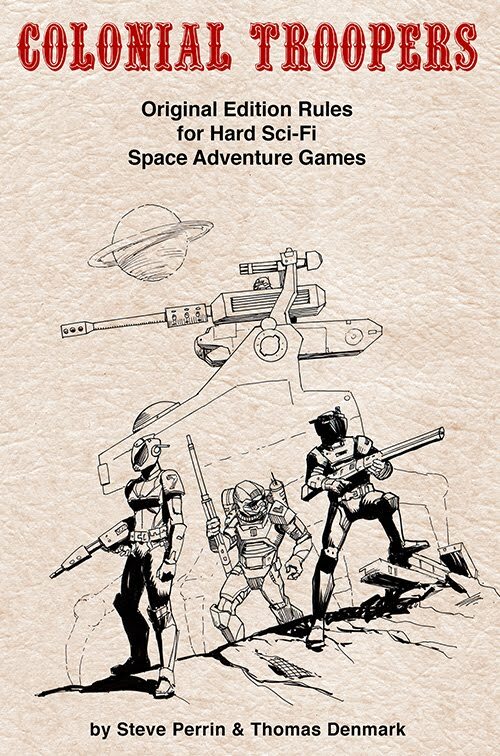 At this point the full 3 volume 1st edition set was available on the market, and is predominantly what new players would know about the game (and the Moldvay edited basic set soon to be released). The Dragon #31 introduces Sage Advice. A controversial feature amongst the OSR to be sure. It represents a changing mood in TSR from encouraging freeform play amongst D&D players, to more official "rulings" from on high. This is really starting to feel like the 1st edition era now. Still, most of the D&D related articles look like they'd work perfectly well in either an original or 1st edition game. 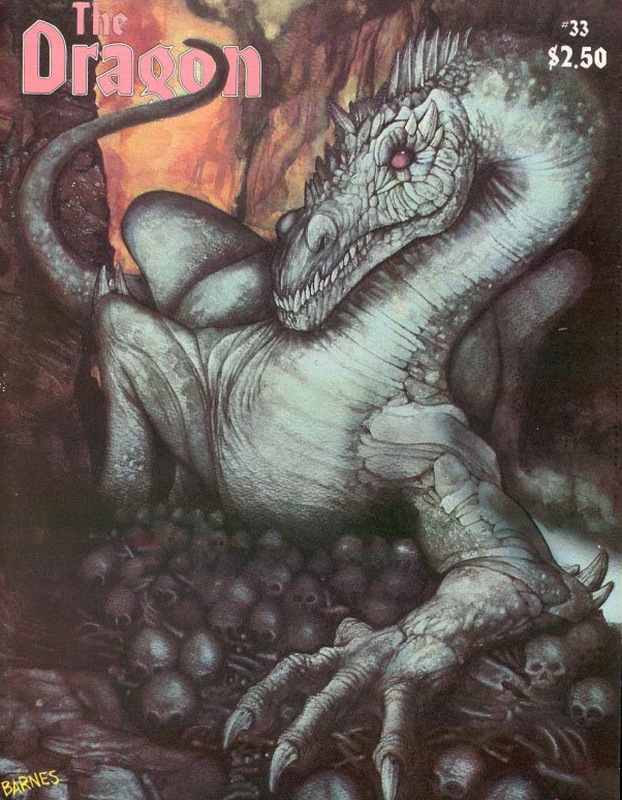 The Dragon #32 has much relatively generic material that could pretty much be used in any edition, and it has an adventure called The Fell Pass that feels very original edition. The Dragon #33 seems to really be all about 1st edition. Perhaps one article Bazaar of the Bizarre could be used for both, but the other article plainly state "AD&D". I'm ending this particular exercise here. I'm sure there are a few original edition oriented articles, but the tide seems to have clearly turned at this issue. So there seems to be a broad gray area from February 1978 through January 1980 where original edition was phased out and 1st edition takes over. Sure The Dragon is a limited slice of the gaming pie from that era, but I suspect it is pretty representative. 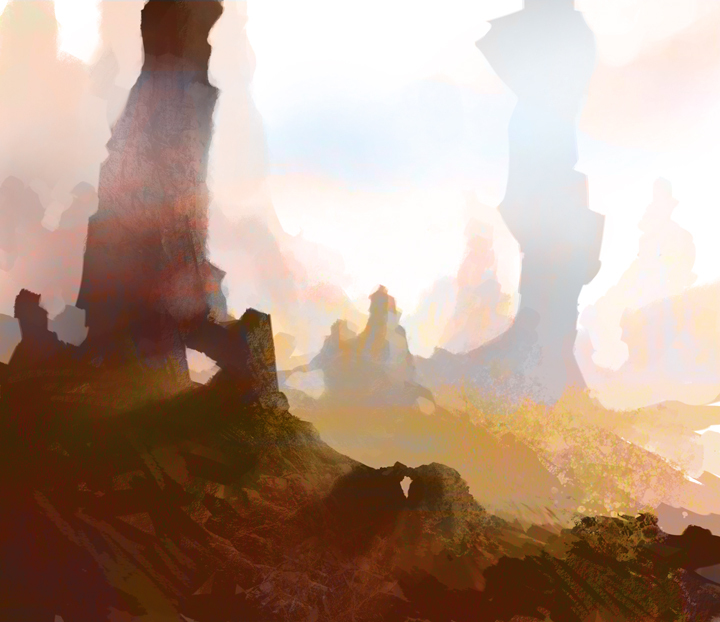 So far I have been keeping these geomorphs rather generic. All the doors are plain open doors. 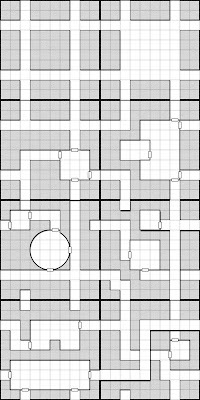 I haven't been adding much in the way of "dungeon dressing", I figure that DM's will want to have control over where secret, concealed, locked, and trapped doors are and what things can be found in the various rooms. I'm curious if you would prefer these have more "stuff" in them, predefined secret doors, statues, traps, pits, etc. Reading through an old The Dragon magazine (#27) I read this mysterious passage by Bob Bledsaw (overseer of the Judges Guild). Dungeons & Dragons is the universal language of fantasy role playing (being the grandfather of the third generation systems). This was published in July 1979. What exactly does he mean by the "third generation systems"? Did this recently for Dungeoneer Deluxe. The inking style was inspired by the great DAT. 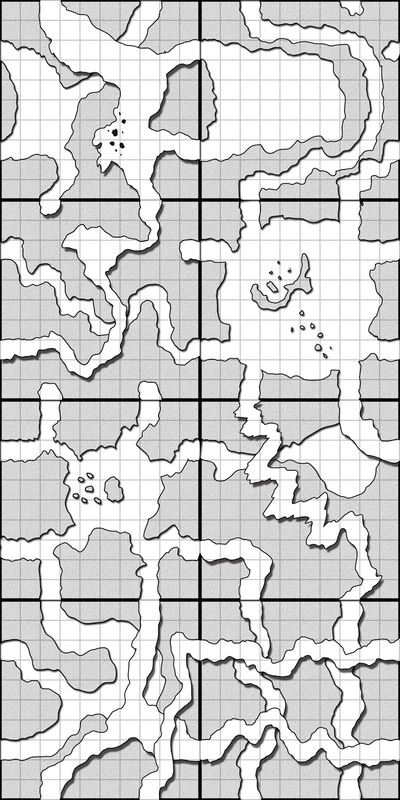 Ok, I missed Monday by 17 minutes, but here are the latest geomorphs for MegaDungeon Monday. Enjoy! 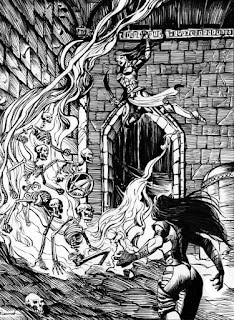 As you have no doubt been alerted by the blogoshere Swords & Wizardry 4th printing is now available. Go get it immediately. It is still my favorite retro-clone. I've only skimmed through it, but I can already tell I like the layout better than the Complete Edition, and it is back to the original, and more appropriate, cover. That cover was very well done it just didn't feel right for S&W, unless it was for a Cthulhu edition of S&W! Still, I can't help but feel the 1st printing nailed it so well that it is difficult to improve upon. Though I nit pick (can't help it) S&W IV looks potentially good. I started this blog when I discovered Swords & Wizardry. S&W introduced me to this exciting movement known as the OSR. I loved how well written S&W was and how well it emulated the original edition of the original, and best, fantasy role playing game. Since then I have played many hours of S&W, exploring it's strengths and weaknesses. I soon came to the conclusion that S&W was a different game from the Original Edition. A beautiful, and succinct emulation, but different nonetheless. 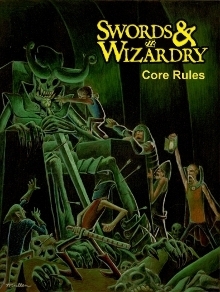 As I have immersed myself in classic D&D blogs and forums like Knights & Knaves, Grognardia, and others, I came to realize the whole OSR thing was much larger, more creative, and more interesting than I had imagined. I was drawn to the original edition - the "white box" set; the original 3 booklets. I have 2 copies of this set. One in good condition, the other previously owned by Lawrence Schick, that has some markups and design notes written in ink in it. This is the version I have taken to playing lately. And I can wholeheartedly say it is better than Holmes, Basic, AD&D, 2nd, 3rd, 3.5, or 4th edition. There is just some magic that the original edition captured that none of the later editions have. 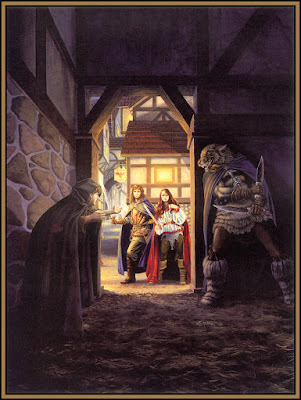 Perhaps it is in the ambiguity and the largely undefined nature that allows the DM to ad lib according to the needs of his own group, But, whatever it is, there is a mystique and a magic to those first 3 books that is unmatched by any later edition, or later RPG I have seen. Which is why I have returned to playing the Original Edition lately. 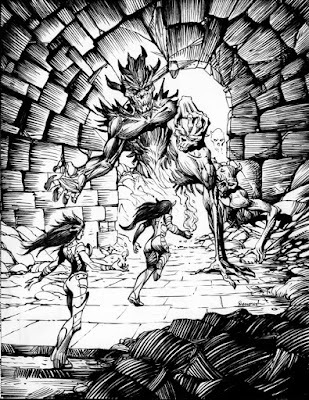 I don't know if I have expressed here how much Dave Trampier is my favorite of the old-school D&D artists. Not only was Wormy one of the most enjoyable features of Dragon magazine, Tramp's art throughout the early TSR products was, to me, the most engaging. 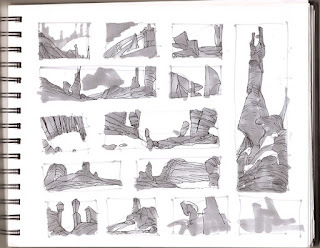 He combined storytelling with great ideas and deft draftsmanship. I believe if he had continued to pursue his art career he would have gone on to great things. But, alas, I guess the world always needs another taxi driver. I have another blog I occasionally post on that supports a DnD inspired fantasy card game I designed and illustrated a decade ago that still has a strong following (a great big thank you to all of you who help keep new shoes on my kids!). 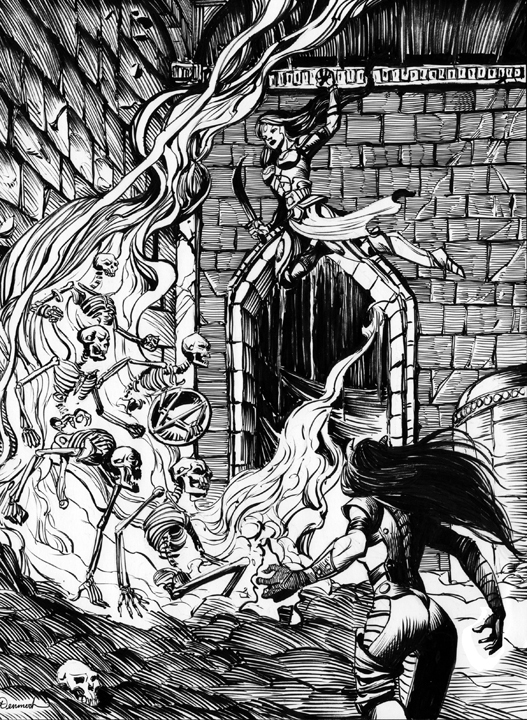 I'm not 1/10th the artist he is, but I have been doing interior B&W art for the latest Dungeoneer set, and the inking was largely inspired by DAT. There will be more to come. 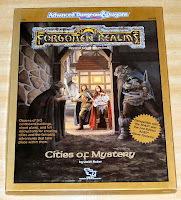 I bought very few TSR products during the dreadful "2nd edition" era, but there is one that has remained as one of my favorite D&D supplements of all time: Forgotten Realms Cities of Mystery. 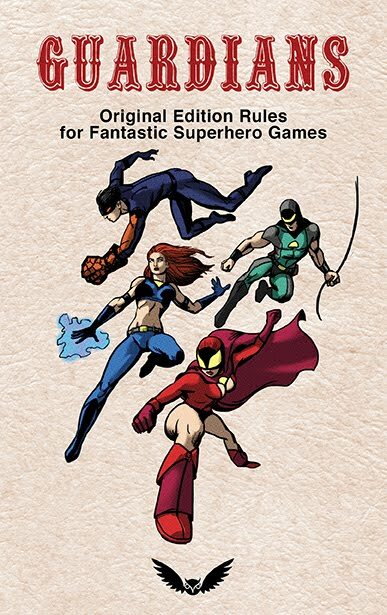 This boxed set has proven to be, and continues to be, one of the most useful sets published. 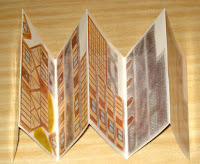 My own boxed set has long since disintegrated, and the cardboard buildings that came with it long gone. The main booklet though remains on my gaming table as an essential resource whenever I have to run a city adventure. Of all the adventure types I always find running city adventures to be the most difficult. Give me a good dungeon any day! Even extra-planar adventures on radically strange dimensions are easier to run than a city. The openness of a city combined with the complexity and endless possibilities drives me to madness. 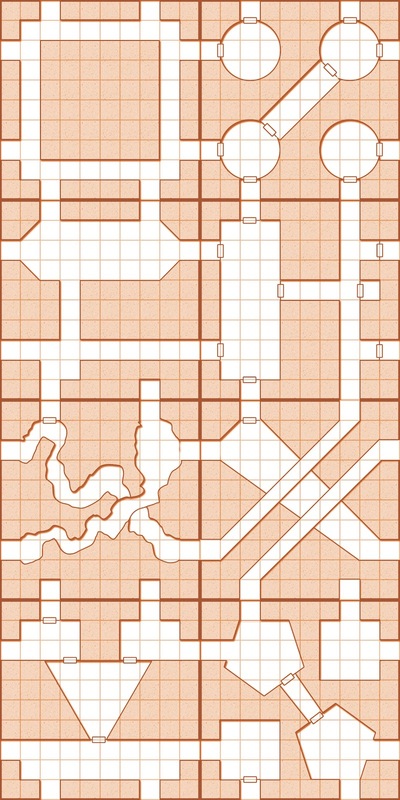 I never seem to have the time to develop a proper detailed city before hand, and I find most published city settings to be tedious at best (City State of the Invincible Overlord, the original Thieves' World set, and Lankhmar excepted). Looking over the credits I see it was written by Jean Rabe and edited by Kim Mohan. 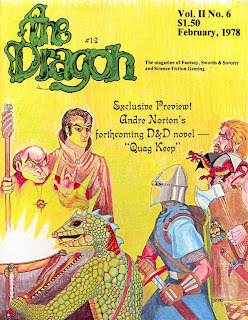 Considering that my favorite era of Dragon magazine was when Kim was the editor, and many other TSR products edited by Kim also being some of my favorites I think that may be part of the reason. While Jean Rabe seems to be a very good writer, though nothing else in her bibliography particularly stands out to me. The first thing about Cities of Mystery that makes it my favorite city resource are the random tables. While there have been many random tables for city encounters such as the excellent one in the original DMG (brazen strumpet!) 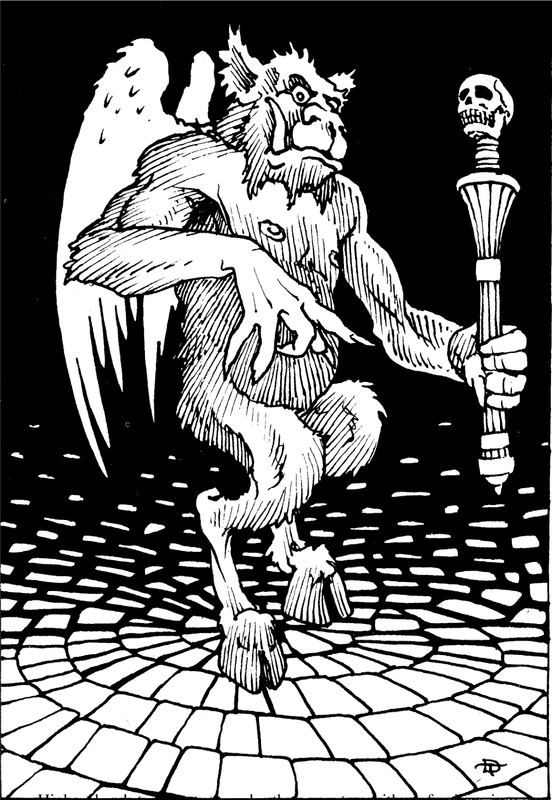 and in Judges Guild's Ready Ref Sheets, I find the ones in Cities of Mystery to be the most useful to my campaign. Particularly when I am playing sandbox style. Which is usually the case, though the occasional "adventure path" appeals to me once in a blue moon. These random tables manage to be relatively comprehensive, yet remain easy to use. I've made a PDF file of the pages I most use, which boil down to 11, 12, 15, 38, 44, & 45. Mixing Governments (page 11). In previous posts I've discussed how to randomly choose two cultures or government types and combine them to create a new, interesting government/culture. Cities of Mystery beaks government types down to 20 basic different types - convenient for rolling a d20 for. You can quickly roll twice and come up with dynamic combinations like: Magocracy Theocracy. Imagine how the tension of ruling bodies of mages and clerics make for a city! Who has the dominant power? How does that affect daily life in the city? Putting Life into Leaders (page 12). With two dice rolls, one for alignment another for personality, an influential city NPC can be rolled up. A Chaotic Good Foolhardy council member, a Neutral Evil power hungry sheriff, or a Lawful Neutral soft-hearted mayor all generated on the fly as needed. 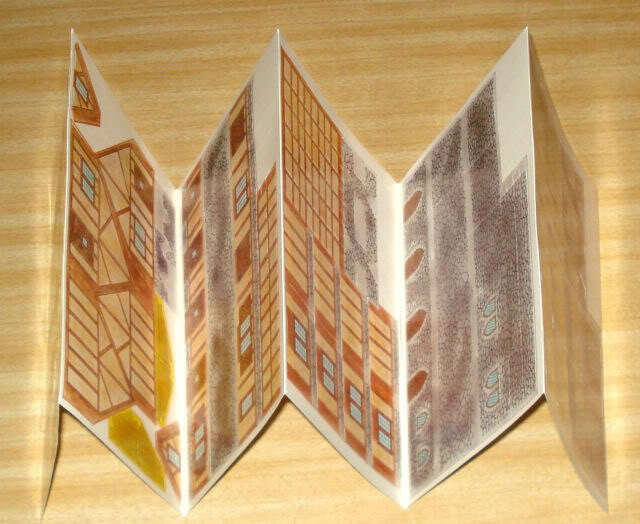 City's Defenses (page 15). Whether the town is heavily militarized and defended, or a sitting duck can be figured out instantly. 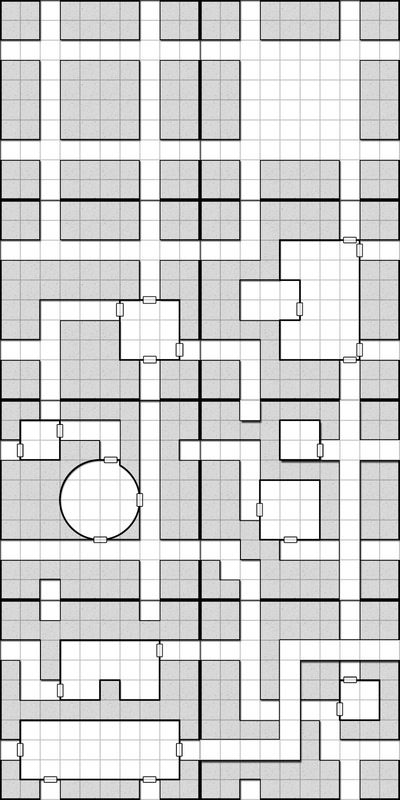 This is very useful, particularly when player's are higher level and operating on city or nation-threatening level adventures. Business tables (page 38). This is perhaps the most useful section. Player's quickly get tired of the typical tavern and store locations. These tables help the DM to come up with a wide variety of more interesting, and believable businesses. Herbalist, Perfumer, Soap Maker, Wainwright, and so on. These are just a few of the business types I probably wouldn't think of on my own in the heat of a gaming session. I like some of the additional modifiers to business types such as: a shoddy store where the merchant is sour and gruff but actually likes to provide a service to help others. These kind of combinations make for a more interesting encounter than just providing a laundry list of items a store has and not much else in terms of "flavor". 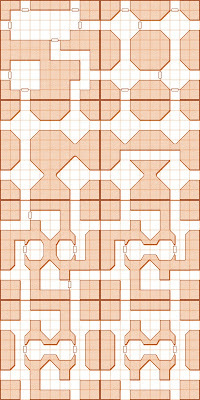 City Encounter Tables (page 44-45). While the business tables are highly useful, the city encounter tables help to keep the game from being stale. Interesting encounters are always right around the next corner. A parade, a pick pocket in progress, an unusual animal running around the streets, or any number of other interesting things can happen. I like that these tables are divided by district type (much like the Judges Guild Ready Ref Sheet city encounters are, but these are far more extensive). Other parts. Like I said, I have long since lost the rest of the boxed set. 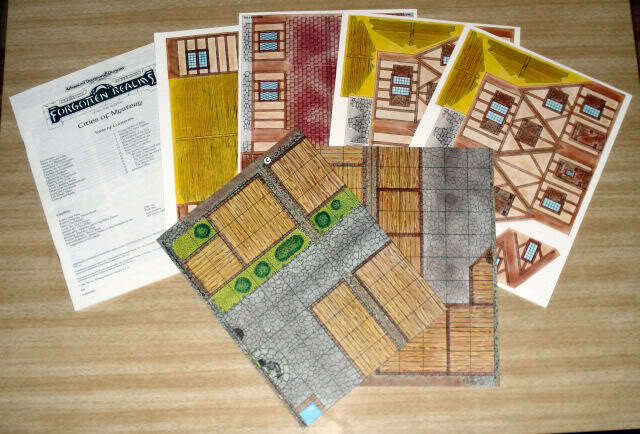 Though I do remember constructing the 3d cardboard buildings and using them on the map posters that were included and using them a lot, particularly for encounters that required use of miniatures to help visualize the scene. The cover of Cities of Mystery is one of Larry Elmore's more evocative covers. A classic encounter with the player characters being offered some bauble by a con man, while a wererat lurks in the shadows waiting to pounce on unsuspecting victims. Anyone who says Elmore paints nothing but the same heroes and monsters over and over hasn't paid enough attention to the wide variety of inspired work he did for TSR throughout the 80's. For something a little different, here are some purely landscape images of Burrough's Mars. One of the things I find most interesting about his descriptions of the terrain are the vivid colors. He even describes colors that don't exist here on Earth. While that is impossible to convey visually, I do like the idea of painting the environment with very non-conventional colors, like yellow rocks, orange mountains and so on. 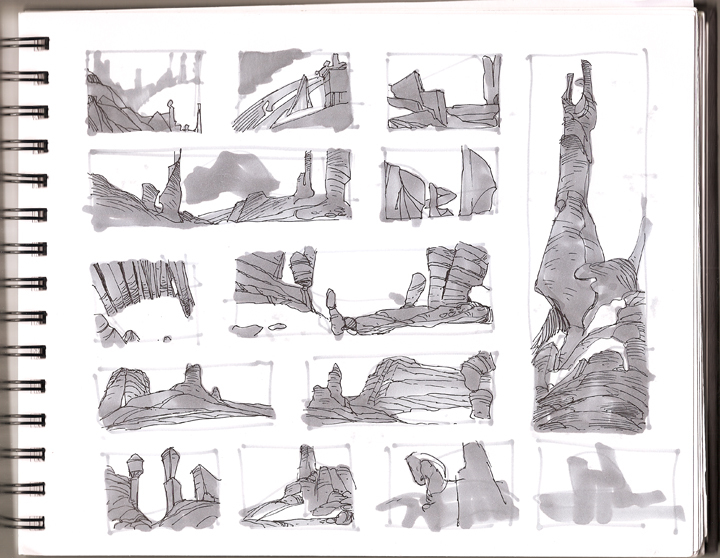 And here is a page of Mars landscape rough marker drawings from my sketchbook. 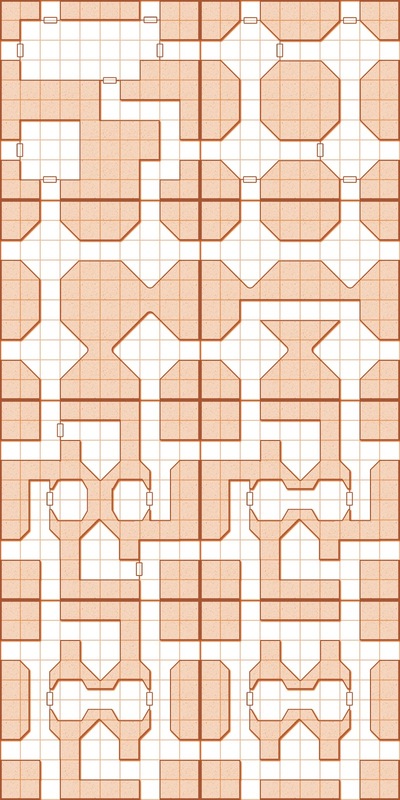 I came up with a name for my regular Geomorph column: Megadungeon Monday. I've experimented with various looks for the geomorphs, here I present 3 versions. Basic B&W, classic blueline, and a burnt sienna color inspired by the Desert of Desolation series maps which I've always been fond of. Your opinion is valued as to which color these should be posted in the future. Enjoy. Cave Geomorphs According to Public Code! The geomorph police busted me for improper gridding of my geomorphs. According to Section 1974 of regulation TSR2002 all geomorphs are to be on a grid of 10 x 10 squares. 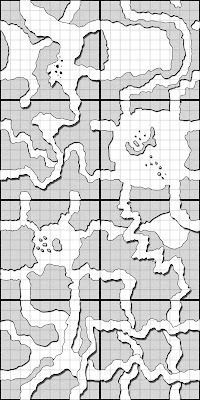 So, I have corrected my heinous error, in addition I have made 7 more Cave Geomorphs for your gaming pleasure! Enjoy.